We have Civil Replica swords, cutlasses daggers and knifes that are great for reenactments, Stage and film prop swords, for display, collectibles and gifts. Some are battle ready civil war swords with carbon steel blades. We have US 1860 cavalry saber, confederate officer’s sword, field officer’s sword, artillery sword, 1860 USN Naval cutlass, US foot officer’s sword, CSA officer’s sword with scabbard, trooper’s sword, civil war bowie knife, civil war D bowie knife, Confederate D guard bowie knife, civil war sword belt, sword belt buckle, civil war sword hanger, CSA officer’s sword with scabbard and others. Come take a look. IXL Deluxe Bowie Knife: This classic IXL styled bowie knife features a clip point 9.5" blade of polished carbon steel. Horn handle with brass hand guard and crosshatching. Comes with a black leather sheath trimmed with silver fittings. Features Overall length: 15" Weight: 1.5 lbs. M1849 Ames Rifleman's Knife: This Civil War fighting knife features a 12" carbon steel blade, wood handle with brass cross gaurd and leather scabbard with brass fittings. CSA Officers Saber With Scabbard has a 36 curved carbon steel blade, brass hilt w/ brown leather, brass wire wrapped handle. CSA stamped blade, steel scabbard w/ brass fittings. Length 43" Weight: 4.3 lbs. U.S. Model 1860 Light Cavalry Saber: High quality replica of U.S. Cavalry saber used in 1860. Features a polished, high-tempered carbon steel blade, steel hand guard & brass finished scabbard. Length: 43", Weight: 3 lbs. CIVIL WAR SWORD BELT. 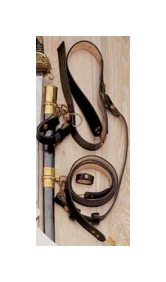 This sword belt is constructed of choice black leather with deluxe solid brass fittings complete with shoulder strap. See diagram of how to wear it below "Detailed Image" . Belt buckle SKU 16-10 sold separately.